If the first three weekends in January are indicative of what our winter diving is going to be like then we are either going to spend the entire season down south on the protected beaches or we can try to sneak away on a short boat dive to one of my favorite and really nearby destinations for boat diving. This week I am going to suggest you find your warmest dive jacket and head down to any Marina and either rent a boat or organize a dive trip to the Pinnacles. You will not be sorry and this is NOT going to be a two hour journey to the Kerama Islands either so please have a little faith and read on. Site Location: If you stood at the mouth of Kadena Marina and drew a line straight across the bay toward those two very tall smokestacks located just outside Camp Kinser you would be drawing a perfect azimuth to the Ginowan Pinnacles. In a boat (it is a long swim) follow this heading until you have lined yourself up just off the Okinawa Convention Center in Ginowan City. It is easy to spot from the boat since it is the largest structure on Ginowan's Coastline. In this area begin to make slow lazy circles with your boat. Looking over the side you will see pinnacles of the reef come upward to within 10-15 feet of the surface. These coral mounds are rising up from 110 feet of water. There are more than eleven of these pinnacles in an area of about one square kilometer. Each has a distinctive habitat of mushroom coral, soft and hard corals. Each can be really magnificent and exciting diving. How to get there: Now that you know where it is you will have to solve the boat problem. That is definitely not hard to do on Okinawa. If you have a solid group of eight or more divers all willing to go with you I would recommend contacting the Kadena Marina at 634 6344. Better still drop by and charter one of their dive boats. Darling's Dream is a boat that has been there so often the boat can probably find its way without help. There is the "C" Falcon and several other good charters too. The best news is that the trip is not very long, so even those divers who lean to chumming rather quickly will find that this is a boat dive they just may enjoy. But please don't blame me if you get seasick. That is supposed to be part of the adventure. If you did not want adventure you would play golf right? What to expect: Well the good news is that you will not have to walk across any of the reef to get to this dive site. Remember that giant stride entry you learned way back in your Open Water Course? Well now you can dust that one off because you will use it here. After striding off the back of the boat I recommend you use the anchor line to guide your descent (why not, you paid for it) and it helps you control your ascent too! When you reach the bottom of the anchor line you will find that you have probably anchored on what looks like a huge Hershey's Kiss. Check which way the current is going and head down the pinnacle into the current. You will want to keep the pinnacle either on your right or your left. If you do you will more than likely find yourself right back at the anchor in about 30 minutes of adventurous sightseeing. You will see loads of clownfish (of course) tucked away in what appears to be mountains of coral formations that are rising up from the deep. These pinnacles have thousands of small little holes, cracks and crevices, all holding surprise after surprise. You will be able to photograph Triton Trumpets that were brought in about six years ago from the Philippines to battle the ever-present Crown of Thorns Starfish. I have always had the great opportunity to photograph plenty of nudibranchs and some really fresh looking Christmas Tree Worms sprouting out from the mushroom coral heads. This is really a photographer's paradise. 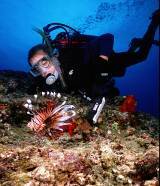 Be sure to check up under the mushroom coral for lionfish and their beautiful cousins the ragged fin firefish as well. The best part of having all these cracks and crevices is the volume of moray eels and octopus that you will see too. Be sure to take a flashlight with you. There are still a considerable amount of shells in these areas too, but please remember we are restricted by Japanese Law from removing anything either living or dead from the water. I recommend that you start your collection of shell pictures here at the Ginowan Pinnacles. Other activities: During summer when the sun is high overhead and penetrating its deepest, the Underwater Photographer can use the blue azure reflection as the perfect backdrop for those buddy shots silhouetted against the surface. After you gain some experience and familiarity with the Pinnacles they are an AWESOME NIGHT DIVE. Aquatic animals found here: Yellow Moray Eels. Octopus. Lion fish. Tropical fish of every kind too include Clown, Butterfly, Chevron, and Blue Damsel fish. NOT MANY DIVERS! Best time of year to dive: All year around. I like it in the winter when I cannot get outside to Sand Island or the Kerama Islands. It is an inexpensive boat dive and a really great way for a diving family to enjoy a really good boat dive experience together. If you are going and want directions just contact me at on my website www.jwchandler.com See you at the dock. I will be the bald guy trying to hitch a ride to the Pinnacles!